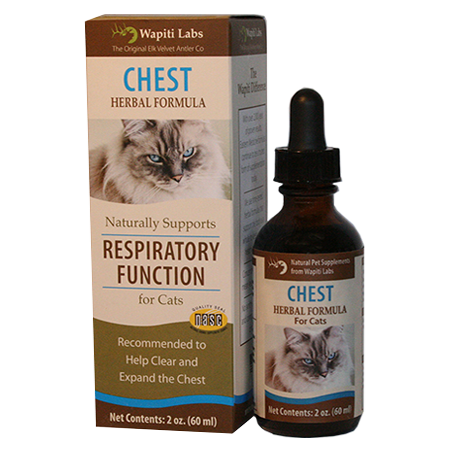 Chest Herbal Supplement for Cats | Elk Velvet Antler | Wapiti Labs, Inc.
Clears and expands the chest for easy breathing. Based on a time-tested, traditional Eastern Medicine formula, this concentrated liquid supplement is formulated with natural herbal ingredients to help support normal respiratory function and health. Not to be used on a dry cough. Not to be used if pet is vomiting blood. Available as a concentrated liquid formula. We do not use synthetic ingredients, and we do use a proprietary process that allows us to retain key organic compounds and nutrients. This product seems to work well for my cat. I will definitely reorder. We have a 9 month old kitten that needed support with her respiratory function, she had many “flare ups”. We started giving her the Wapiti Chest Formula at the beginning of her last flare up, and there was a noticeable decrease in her breathing issues. This product also seemed to help dry up her weepy eye, which is another issue of her. I would definitely recommend this product! I have a 7 1/2 month old kitten who was wheezing when she would breathe plus she was sneezing and had mucus coming from her eyes and nose. People would often ask me if my cat was okay, I wasn’t sure. I purchased this bottle of Wapiti Labs Cat Chest and she is only on week 2 and there is a 100% noticeable change. She is breathing normal again and has less mucus. She is like a new kitten again. She coughs a little bit but again its only been 2 weeks! I recommend this product. I wish there were more reviews I’m curious what its doing for other cats. Our 23 year old cat Charlie, has suffered from respiratory problems for two years after another animal attacked her outside. The doctors said that at her age, there was not much they could do, without great expense. Two weeks ago, she had another attack after changing cat litters (to a natural pine, not good), she started wheezing, stopped eating, and I thought she was going to leave us. I called the vet and they couldn’t see her for a week. We were heart broken. I ordered some Respiratory Function Chest from Wapiti Labs after researching the internet on Friday and it was here on Monday. I gave her 1/2 dropper twice a day for four days. She is breathing normally, and started eating and drinking again, in fact, she’s better than she has been in two years! Thank you so much for creating this wonderful product.